Jonathan Meiburg writes songs about birds the way some people write songs about love. As the frontman of Shearwater, Meiburg alternates between golden baritone and soaring falsetto, writing songs that celebrate the splendor and the perils of the natural world. 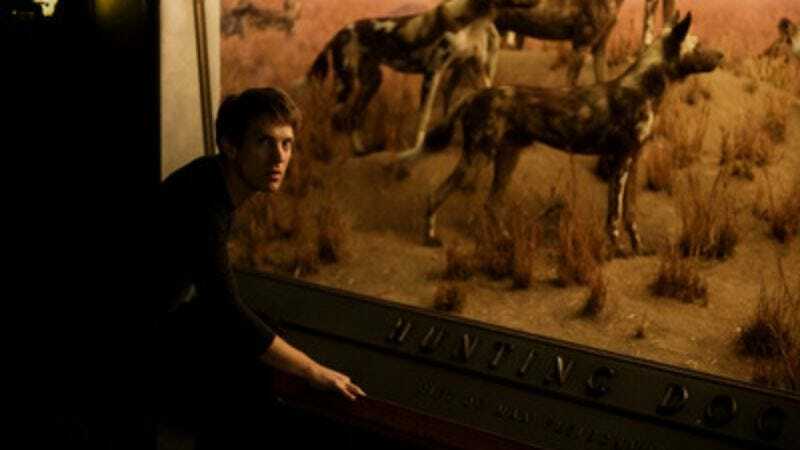 (The band’s Twitter page describes Shearwater as a “roc-art band.”) Shearwater’s latest album, Animal Joy, breaks from the vulnerability of the band’s previous efforts, emerging as a roaring bird of prey—but it still has the hollow, haunting bones of Meiburg’s barer compositions. Talking to Meiburg is a little bit like talking to your favorite college professor—if your college professor divided his time between touring the world and traveling to some of the Earth’s most remote locations to study birds. Because he has the kind of dual résumé that straddles art and science, Meiburg talked to The A.V. Club on how he sees our relationship with the natural world via pop culture, the authenticity of Creedence Clearwater Revival, and that dinosaur in Tree Of Life. The A.V. Club: Shearwater just ended a tour of Europe, and now you’re starting another North American tour. It’s been a big year. Jonathan Meiburg: It’s funny… on the plane on the way back [from our European tour], I watched that movie The Big Year, because so many people had told me, “Oh, you have to watch it, it’s this cute comedy about birding!” And… there’s some nice bird photography in it. But it’s a typical stupid Hollywood family comedy kind of thing. It’s about these three guys who embark on this “big year project,” which is to try to see as many birds in North America as they possibly can. Needless to say, this is a competition for people who are idle one way or another, either because they’re broke or because they’re loaded. And the whole concept of birding is one that I’m a little uneasy with—elevating it to something that’s beyond a hobby. Because on the one hand, there’s bird research and really trying to get into the world of birds, and beyond that—because you can’t consider that in a vacuum—the world of habitats that they live in and what’s happening to those, and the way that all the different pieces of those systems work together. But then there’s just birding for the sake of checking it off on a list. And that seems to me to take something which should be about experiencing the life of another creature… It’s just another way of collecting doodads. I just think that there’s a certain kind of mania that overtakes it that just sort of changes it into one more thing to be collected. AVC: Have you seen the “Put A Bird On It” skit from Portlandia? JM: I actually haven’t, but I’ve had it described to me before. AVC: It’s kinda great, because they start making fun of how everything becomes art when you put a bird on it, right? AVC: And then at the end of the skit, these real birds fly into the store, and everybody completely freaks out. JM: [Laughs.] See, that’s perfect. That’s actually a brilliant little comment on the way that we experience nature. We like to have it comfortably at arm’s length where we can see it and where it’s not likely to do anything surprising or nasty. JM: I’m not the first to point this out, but when you think about those Planet Earth films—our ability to document and vicariously experience the natural world has increased at the same rate as our ability and willingness to completely destroy it. In kind of the same way—there’s a way in which recorded music destroyed music. Like, one of my favorite sets of recordings is this thing called The Secret Museum Of Mankind. It’s a set of field recordings from around the world that was made between the mid-’20s and the mid-’40s. You get this sort of snapshot of music the world over at a time when recorded music had not yet completely changed the way people thought about music—and detached it from time in the way that recorded music does. You know, music used to be something that either happened in front of you, or it didn’t happen. I think music just sort of used to be part of—it wasn’t regarded as such a separate thing from the rest of life. It was something people did, and the thing was, you had to make it in order to have it, for the most part. It didn’t used to be regarded as something quite so special, or something special people do, you know what I mean? Although there were all these people who were renowned for being particularly good at it. But I think that recorded music has tipped that, and in a way, took music away from everyone, even as it gave us this ability to document it. As we’ve taken over more and more of the planet for our own uses, our passion for [music]—and ability to catalog everything that we’ve displaced—has gotten better and better and better. AVC: So how does it feel now to be one of the special people? JM: [Laughs.] I don’t know about that! It’s a good job, I mean, it’s an interesting job. Like any job, it’s got things about it that are pretty tedious, but playing shows is certainly rewarding. That feeling of getting to play for an audience and to sort of participate in this thing together. AVC: The new album has often been compared to Talk Talk, but there’s other stuff there as well—maybe some similarities with The Chameleons, which, bizarrely, has a really goth following in the U.S.
JM: Goths are often on the side of good! They appreciate theater and ritual in music and the power of that. The goths aren’t after authenticity. Because, I mean, there are no authentic ghouls. [Laughs.] You’re not actually a vampire. I dunno, a lot of goths are big fans of Swans, or people I’d characterize as kind of gothy. They often have a wonderfully really wicked sense of humor, also. I think they’ve got a much more skeptical view of the world as it’s presented to you, the human world. And so God bless the goths. AVC: In terms of images in pop culture, it seems like there’s a lot of things—you mentioned Planet Earth, there’s Winged Migration, images in the movie Tree Of Life—all of these things, that no matter how city-bound we get, there’s still this collective fascination with nature. JM: With Tree Of Life and with Planet Earth, you’re presented with the comforting-slash-disturbing image of—in the case of Planet Earth, a world that’s mostly without people. Tree Of Life is more preoccupied with the idea of deep time—the kind of time the way that geologists think about it, the wilderness of time that existed before we were here. Which can offer a kind of comfort in a weird way. I read this book called Annals Of The Former World by John McPhee a couple years ago. It’s basically a geological history of North America with a whole lot of digressions. One of the things he mentioned in it is that if you compress the history of the Earth into a week, the dinosaurs appear at 4:30 p.m. on the last day, and the Industrial Revolution happens a half a second before midnight. JM: When you realize how much of the existence of our planet has taken place without any kind of life that we would even recognize—on the one hand, it makes you feel very tiny, but there’s also a kind of reassurance and consolation in that. This feeling is kind of metaphysical, really, that somehow we’re a footnote to a much greater being. And we cannot destroy that being. AVC: That comes through a lot in Shearwater’s music, particularly in Animal Joy. You have this great line in the song “Animal Life”—“surging at the blood’s perimeter / the half-remembered wild interior”—which kind of captures what you were just saying—that we’re all part of this deep-time continuum. Like in Tree Of Life. JM: Yeah—it’s, “Where do we fit into this?” I think for a long time, people have clung to the idea that we’re the most important thing that there ever was. And—because the idea that we’re insignificant is frightening. But then there’s another way that insignificance can be comforting. It kind of turns it inside out. And on our last records, I was sort of preoccupied with this feeling that we’re destroying the world, you know? Especially all the places that I’ve been lucky enough to visit over the course of my research and traveling—I’ve seen glimpses of what the world was like before people were in the game. And there’s such a sadness at seeing places disappear, because so much is lost. But on the other hand, if what we’re really longing for is a world without people, that’ll happen eventually. [Laughs.] You know? I feel relatively certain about that. So, if that was really what I wanted, I should relax. Likewise, the world has been so perfected so many times in so many different ways that the landscapes that don’t exist on Earth anymore are here… That to want it to be a certain way now is just kind of greedy. So, with this record, part of what I was getting into was that feeling of acceptance, a little bit, and of not being quite so wound up in my idea of what the world is supposed to be like. And remembering that I myself, and all of us, are expressions of the life that began here such a long time ago and that is moving toward some end which we don’t know. AVC: The music that you write also falls in the middle of this spectrum—somewhere between hippie nature worship and a man-versus-the world confrontation. JM: I’ll hug a tree! I’m not ashamed to hug a tree. [Laughs.] But at the same time, I’m with you. I mean, the thing about—one aspect of human consciousness is that we tend to see ourselves everywhere. AVC: Animal Joy is about so much more than birds, and you’ve resisted, a little bit, this label you’ve gotten as a bird fanatic. JM: Only in the cutesy sense. You know, only like Owen Wilson in The Big Year. JM: [Laughs.] Oh, birds are foxy, there’s no question. I just don’t want—I wouldn’t want anybody to think that I only think about them—that when I look at a landscape, I see birds in color but everything else in black and white. Do you know what I mean? They’re a window on to the larger world—they’re like a messenger that comes to you from that world. A lot of birders talk about the first bird that they really saw in a particular way—they’ve seen lots of birds in their life, but there’s something about one particular individual that turned them somehow. AVC: There’s also the human fascination with flight. JM: Flight’s a thing that’s never left us. We as people figure that into every kind of mythology you can think of. And although it’s funny, because in the Falklands, which is where I sort of got my conversion experience, there are a number of flightless birds. And thing that makes a bird a bird is not whether it flies or not, it’s whether it has feathers. And I couldn’t help—you can’t help pitying the giant flightless duck of the Falklands. It doesn’t seem to bother them, I have to say. They’ve given it up. They’ve decided they didn’t need that. And this is a thing that happens to a lot of species. It’s a curious thing. JM: Was it eagles knocking goats off cliffs? Oh, no, no, it was the kakapo! [Laughs.] It’s this giant, flightless, nocturnal burrowing parrot from New Zealand… I’ve never actually seen a kakapo. I’ve seen the island where they live. I glimpsed it from shore, but I’ve never actually seen [the bird]. They look like big, green owls. AVC: But you’ve studied some other pretty interesting birds in the Falklands. JM: Yeah, which I’m actually going back to study this year. I’m spending almost this entire year on tour except for the month of August, when I’ll be down in the Falklands on an island for a month watching these things. Those birds are called striated caracaras. They’re a weird sort of bird of prey that act a lot like a crow [and] live around penguin and albatross colonies in the southern summer, and eat their chicks and eggs. But in the wintertime, the seabirds are all gone—they’re out at sea foraging and drinking salt water—they don’t need land, but these guys are stuck there. So we’re going to see what they’re eating in the winter. It’s always been kind of a mystery. So that has to be my favorite [bird]. That was the bird that sort of looked me in the eye, and we saw each other. They’re a fascinating species in that they’re very curious, they’re very social, and they’re interested in anything they haven’t encountered before. Which isn’t a trait that usually serves you very well in the animal world. [Laughs.] But in this case, they’re sort of—they don’t have any predators, and there’s not a penalty for being this inquisitive. The thing is, they’re also like us in that way. We have the same kind of compulsion. And—so you kind of recognize that kind of mind when you look at them. What’s always preoccupied me about them is wondering why—how did this kind of mind evolve in this creature that I would sort of recognize it? This thing that lives on these islands that are sort of—they seem almost magical or otherworldly. It’s very mysterious to me. AVC: You mentioned Tree Of Life earlier, and this idea of deep time. There’s that very otherworldly scene at the end, where the son returns his dead brother to his parents. JM: I mean, this idea of a world that exists outside of time, in which all the past, present, and future versions of everyone coexist—that’s a pretty good conception of an afterlife. All the same, I felt like dramatically, that part didn’t quite work for me. I love the middle third of it—all the stuff with the little boy, who Sean Penn plays as an adult. He’s such a great actor. That whole sequence, that really pulled me in. I have to say, I even preferred it to the dinosaurs and the special effects. AVC: What do you make of the dinosaurs? The part where the one dinosaur puts his claw on the other one’s head, and then lets him go—doesn’t that kind of fly in the face of what science tells us about animal instincts? JM: The thing is, the more we learn about animal behavior, the less claim we’re able to make for the uniqueness of human beings. There’s certain behaviors that we’ve reserved to ourselves for a long time. Especially altruism. Or spite. But it seems that the more animal behavior is investigated—and not just on a population level, but on a level of the individual—the less special we become all the time. AVC: Oh, we’ve seen all of them. JM: We tend to write this off, like, “They think it’s another [pig]”—that’s usually the way it gets explained away. But animals are awfully good at recognizing other animals like them. I don’t think we should discount completely the idea that they can become attached to certain other individuals. Individual beings. [They can] recognize them as being like them, and, indeed, even becoming friends with them. We tend to think of the concept of friendship as being a human thing only, and I just don’t think—that’s a silly idea. AVC: So maybe the generous dinosaur in Tree Of Life isn’t totally off base? JM: [Laughs.] I just don’t think it’s impossible that that could have happened at some point. Now why that would have happened exactly, what changed the mind of the one that looked like it was about to strike a deathblow at the other one, I mean, who knows? But it throws us back into this idea that we’re all sort of expressions of the same life force. Even if altruism or pity is not evolutionarily advantageous, that doesn’t mean it doesn’t happen sometimes. AVC: But in terms of what you were talking about, this sort of animal consciousness, both in them and in us, that seems to come through a lot more in Animal Joy. You’ve talked a lot about this being a more immediate album. What precipitated that? JM: Yeah, I mean, let’s see. A number of different things happened in my life where a bunch of things changed—a relationship that ended, we switched the record label, I moved here [to New York], although that was after we finished the record. There are points in your life where, suddenly, everything changes. And I think that happens to a lot of people. And I thought, I should—I was amazed throughout the entire thing how alive I felt—whether I was terrified or really, really sad, I just felt very much in my body. And I wanted to convey some of that experience in my album. The title for it came to me when I was walking my dog down the street, and I was just thinking about the way he experiences the world. He wants to eat right now, he wants to sleep right now, he wants to be with you right now, you know, he doesn’t—he’s just very present. And that, to me, is animal joy. It’s that quality of always being right where you are. It’s a quality that we’re often missing in our lives. We tend to live in the Internet, or thinking about the future, or dwelling on the past, without feeling that—without realizing that the future only flows from the present. And—like, lately, I’ve been thinking a lot about the idea of hope. And I’ve kind of decided that I want to abandon hope in favor of trust. Because hope is always about things that might happen in the future, whereas trust is in the present. AVC: What did you think about in Winged Migration, how they trained those birds to follow the camera? JM: Yeah, they got an imprint on the camera and followed it around. I don’t particularly have a problem with that unless they had lied to you and told you that they had not done it. You know, it’s funny, we like our wildlife, as well as our entertainers, to be authentic. But I always think of John Fogerty as an example of the lie that’s at the heart of that. Because—Creedence Clearwater Revival was from Oakland. [Laughs.] But that music is still totally satisfying. I think people tend to want a lot out of—they don’t just want people to be able to play a kind of music or something, they want people to embody the life of that music in their color of skin, or their lifestyle. It’s just absolutely silly. But by the same token, the idea that a wildlife [camera] is okay if the photographers somehow weren’t even really there. AVC: There were some other images of nature that you said you’d been thinking about. And there’s one other thing that I wanted to leave you with, actually. This is hardly a television show or anything, but in St. George, Utah, there’s an outdoor outfitters kind of store. And on the way out, there’s a bulletin board where they’d tacked up all these photos of customers with animals that they had killed hunting. It was sort of like how you would expect, but then some of them were completely bizarre. There were a lot of them with people killing leopards, or kudu, or—like the first brown bear killed by a 10-year-old boy—a 10-year-old boy can kill a brown bear? And just all these photos of people holding up—usually the heads—of these animals they had just killed. You could argue that setting aside land for hunting is a pretty effective conservation technique in a lot of ways. But the thing that really struck me about this was the look on everyone’s face, which was absolute, pure joy. You know, they were so flushed with their own being, and with the experience that they were having—it was just beatific. All of these people, even if it was just a rabbit that they’d skewered with an arrow so effectively that it’d gone in one end and out the other. And something about that—I don’t know if it’s asserting mastery over the animal world, I don’t know if it’s this hunting instinct that we do still have—and, I mean, I’m sure birding is just sort of a sublimation of it, the same way that sports are a sublimation of war. I don’t know—there was something sort of profoundly mysterious and moving and jarring about all those images. AVC: It’s interesting that ardent nature lovers are also often ardent hunters. They love nature, but they also love the thrill of the kill. AVC: Like the dinosaur in Tree Of Life. JM: [Laughs.] That one dinosaur! “You get to live. I’m not going to eat you today.” That’s the thing about that bulletin board that haunts me, is that I don’t have an answer for that entirely. The expressions on those people’s faces were too profound for me to write it off. There’s a profound, real joy in that that makes me uneasy, but also, I suspect, is at the heart of who and what we are. It’s hard not to acknowledge that the natural world does involve an awful lot of killing.